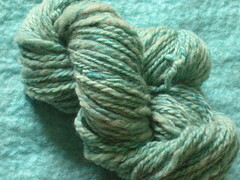 went in first, handspun merino/tussah blend. the silk took up the dye a little more than the wool, but it’s rather less exciting than i hoped, perhaps it will improve in the knitting. 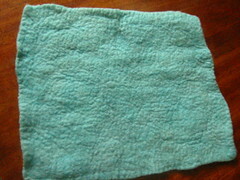 it’s the first time i’ve dyed merino and the yarn felted a little. i’m not as conscientiously gentle as i realise i should be when i dye and i’ve avoided merino thus far because of that. it’s not a disaster but it is noticeable, though i’m not sure whether then end result would have been better or worse had i dyed the fibres before spinning. it’s a mix of merino and bfl. 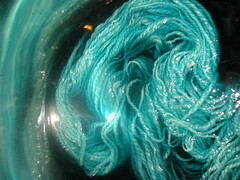 the top layer of one side is bfl and the sheen it gives compared to the merino is noticeable and rather lovely. this took the colour a treat, and while it’s not totally even i’m very happy with it. shocking the boiling hot felt out of the dyepot straight into a bowl of icy cold water tightened it up a treat too. i just love the waffley, seersuckery texture of well-and-truly-fulled felt.